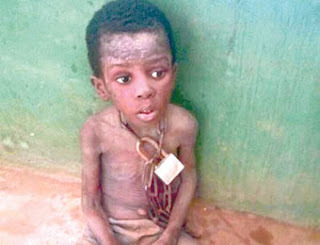 After a manhunt, the Ogun State Police Command yesterday arrested 40-year-old Pastor Francis Taiwo of Key of Joy Celestial Church in Ajibawo, Otta, who had chained his son, Korede, for more than one month because, according to him, the child stole food. 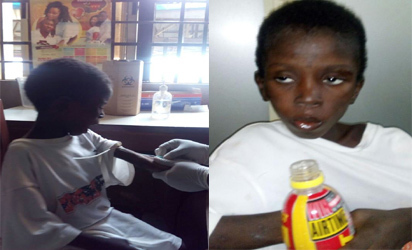 According to the police, his arrest was made possible with the assistance of members of the Celestial Church of Christ (CCC) in Otta. The police disclosed that during their investigation into the case, it was discovered that none of Korede’s siblings lived with their father, adding that the so-called pastor confirmed that he chained Korede because he felt he was possessed and was unhappy about his stealing. 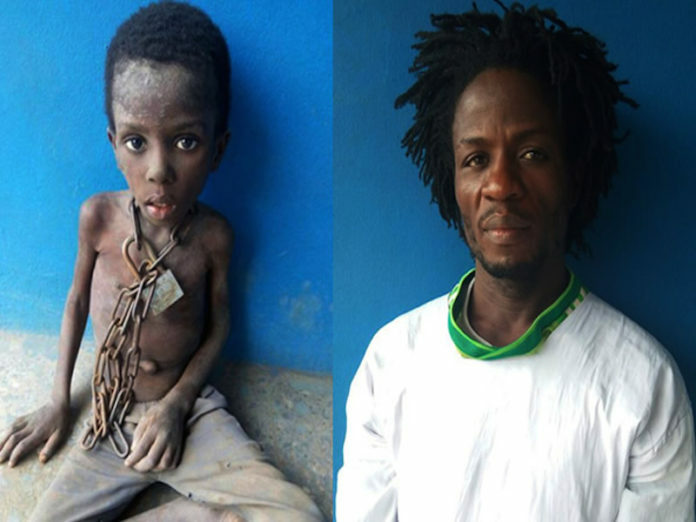 On Saturday, operatives of the command rescued Master Korede Taiwo from a room in the church where he had been kept with a chain around his neck attached to a heavy log of wood by his dad for more than a month. The police got a tip-off from a neighbour in the community, following which the command immediately swung into action. They disclosed that Korede’s stepmother, Mrs. Kehinde Taiwo, who was arrested on Saturday, revealed that Mr. Taiwo’s cruelty to his son stemmed from the boy’s alleged stealing. Providing more insight, the state Police Public Relations Officer, Muyiwa Adejobi, said Mr. Taiwo, who hails from Benin Republic, but was born in Otta, Ogun State into the same Celestial Church and was ordained a pastor in the church in 2012. Adejobi said Francis had married two wives before he got married to Kehinde Taiwo, a suspect in the ongoing case at the command. He said Mr. Taiwo, a father of five, confirmed that Korede’s mother, Marine Taiwo, who hailed from Delta State, was no longer alive. Adejobi said the case would be transferred to the Anti-human Trafficking and Child Labour Unit of the command for necessary investigation and action on the welfare of Korede as directed by the Assistant Inspector General of Police (AIG) in charge of Zone 2 Command, Onikan, Lagos. He added that Korede had undergone treatment by the police and was discharged, disclosing that he was currently receiving all the necessary attention from the police personnel at the Onipanu Division of the Police Command. “The young boy will soon be handed over to the Ministry of Women Affairs and Social Development in Ogun State for necessary action,” he stated. 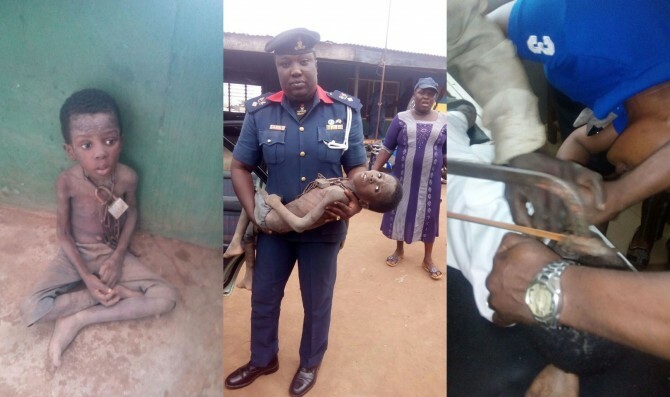 He said AIG Abdulmajid Ali warned that any parent or individual who maltreats children would not be spared, adding that he has zero tolerance for such criminal and inhuman offences, including domestic violence.